He rescued five people from that house when arsonists set it ablaze -- but Vivier couldn't save himself. He and three others died, and two people have been charged in their deaths. Vivier's body, unclaimed and unidentified for weeks, seemed destined for an anonymous, modest burial. However, Jody Fesco -- who met Vivier while she was volunteering at a soup kitchen and had even invited him to her wedding -- heard that Vivier may have died. Fesco and her husband contacted their friend Haraz Ghanbari, an Associated Press photographer, about the situation. Ghanbari took the lead to make sure Vivier wasn't forgotten, tracking down the family members and arranging a proper funeral. 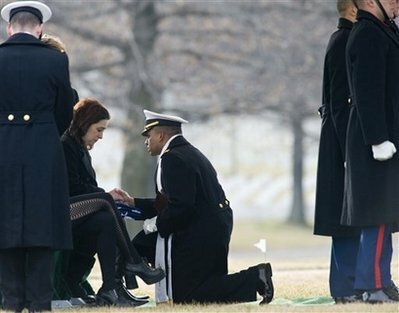 On Friday, Vivier's ashes were inurned at Arlington National Cemetery with full military honors. "You can see from what he did that he definitely had a good heart," said Mercedes Cruz, Vivier's ex-wife of 23 years, who attended the funeral with the couple's children. "No matter what our difficulties were in our marriage, I'm very proud of what's happened." For his grown children -- who now are scattered around the country -- Vivier had been gone for about 15 years. They know of his heroism now -- but they don't know much about the man he was trying to become. 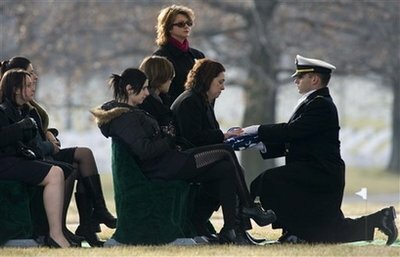 They remember their dad's struggles with alcohol and other troubles. "What I'm trying to get out of this is to have one good, concrete memory that I can have of him for what he did to save those people," said his oldest daughter, Elisha Vivier. "I'm proud of the man that he was becoming." Vivier was a private in the U.S. Marine Corps in 1965 and 1966, though he didn't see combat. He was stationed at Parris Island, S.C., Cruz said. After his discharge, Vivier spent years working as a machinist, welder, iron worker and other tough jobs. He loved the outdoors and moved his family from Alaska to Oregon. "He was just adventurous," Cruz said. "He loved to see different places and see what it was like to live there." When he was homeless in Cleveland, he was proud to have one of the best shanties around, said Fesco, 29, who met Vivier at a soup kitchen. "We hit if off right away," she said. She took Vivier home for Christmas one year and later invited him to her wedding. Vivier was genuine, she said, "a real gentle spirit. "He was trying to get himself out of some struggles -- some struggles with alcohol -- and just do better for himself, and he was, which was fantastic," Fesco said. 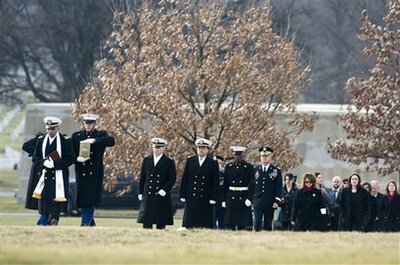 Ghanbari, who is an ensign in the U.S. Navy, helped arrange for Vivier's remains to be placed in a columbarium wall at Arlington National Cemetery. The site overlooks the Pentagon with the National Cathedral and Washington Monument in the distance. 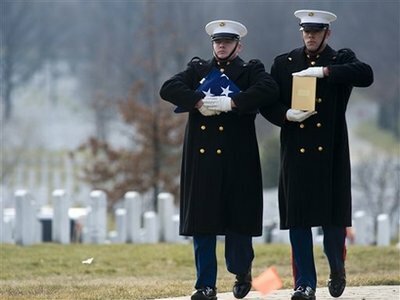 At the military service, seven Marines fired three rifle shots, and a bugler played taps. Elisha Vivier carried a gold urn with her father's ashes to the wall and placed them inside, alongside the remains of thousands of veterans. Ray Vivier was quiet, friends said, but people knew who he was. Cleveland City Councilman Joe Cimperman met Vivier years ago while working as a social worker. He said Vivier was quiet, yet kind and compassionate. More than 125 people attended a memorial service weeks after the fire in Cleveland. "It was a huge blow for the community. This was one of our neighbors who people cared about and knew," Cimperman said. "We're less because he's gone."